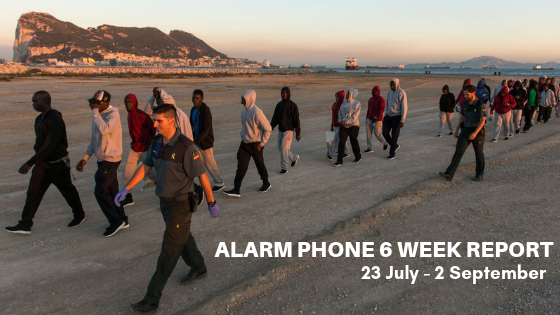 We republish the Alarm Phone 6 Week Report, 23 July – September 2, to give an idea about what happens at the outer borders of the European Union in a time period of 6 weeks. After the Alarm Phone report we published a short call about our work with S.O.S. Kladusa and Cars of Hope at the Bosnian/Croatian border. Winter is coming and we need your support. In late July 2018, within a single day, about 700 people overwhelmed the fences of the Spanish enclave Ceuta that separate Morocco and Spain. Two days later, on the 28th of July, 888 people crossed the Western Mediterranean Sea to Spain. A day later, more than 300 people were rescued and brought to southern Spain. Over the last week of July alone, the Alarm Phone supported 91 boats in distress coming from Morocco – 179 over the past six weeks in this area of the sea. With more than 28,000 sea arrivals this year, the Western Mediterranean migration route is by far the most frequented. It is, at the same time, the most self-organised where groups of travellers build networks to enact their freedom of movement by crossing over fences or through the sea. The backlash, of course, did not take long to materialise. Already in early July, Frontex had sent out warning signals about the increase in migration along the western route, and in light of unrelenting movements, sheer brutal force was used to dispel, at least temporarily, the migrant travellers. Thousands were subjected to police violence in raids that led to their incarceration and removal to the south of Morocco. Many were injured and some lost their lives as a consequence. And yet, many have not given up but returned north, scaling the Spanish fences or taking to the sea. As mentioned in the introduction, in Morocco, the transit country for travellers attempting to reach Europe via the Western Mediterranean Route, we witness an incredible level of oppression and violence towards Sub-Saharan travellers in response to the increasing numbers of departures. On the 8th of August, the situation in and around Nador escalated. Violent raids were carried out by the Moroccan forces and huge numbers of Sub-Saharan travellers were arrested. We received news of around 500 people who were held at the police station in Nador, with continuously more arriving. They were deported in 15 buses to southern Morocco and to the Algerian border. Since then, Moroccan forces operate every day in Nador and the surrounding camps in the woods. The makeshift camps of travellers are being destroyed and burned down, and the people deported, not only to the south of Morocco, but also to the Algerian border near Oujda. Some manage to re-escape to northern Morocco, whilst others are pushed into Algeria. Also in the Tangier region, the situation is more than tense. Raids and massive violent arrests occurred throughout the whole month in the neighborhoods of Mesnana, Braness and Boukhalef and they are still ongoing. People in the neighbourhood Braness have been evicted by the police under the pretext of ending illegal subletting. In the same area, local racists have also started to evict people by themselves. Raids and waves of arrests are known in the region, but local activists suggest that this is the heaviest deployment of force since 2011. On the 26th of August alone, we learned that more than 500 people were arrested in the city and brought to the Tangier Commissariat. Videos on social media showing the march of some 200-250 Sub-Saharan travellers through Boukhalef/Tangier towards the Spanish consulate demonstrate a great will of resistance and courage. The violent dispersal of the march and the arrest of the protestors can be seen here on tanja7.com. Until the 31st of August, in the Tangier region alone, between 1,500 and 1,800 travellers were arrested and deported. The issue of illegal immigration was at the heart of a high-level meeting, held in Rabat, between the African diplomatic corps and Moroccan ministers. The Moroccan ministers indicated that the arrests “do not call into question and are not contradictory” with the policy of regularization of migrants in Morocco, launched in 2013 and having already allowed the regularization of more than 50,000 people. Nevertheless, the Alarm Phone has gathered testimonies of people who have been arrested despite officially being regularized. Some European media outlets have openly accused Morocco of voluntarily letting migrants to Spain to obtain a better fishing agreement with the EU which has been in negotiation for months. The Euronews channel, the Spanish edition of the Huffington Post and the newspaper El País strongly relayed this thesis according to which the Moroccan government had, from February 2017, uttered threats by barely veiling the “weapon of migrants”. After finally signing the deal on 27th of July, the Moroccan authorities seemed to respond to European critique concerning the rising number of departures through the drastic police and military operation at its northern shores. On the 26th of July, 700 people jumped the fences of the Spanish colony Ceuta, with around 100 being pushed back directly by the Spanish Guardia Civildespite the claim made by the Sánchez’ socialist government to reconsider the illegaland hence controversial practice of the so-called ‘hot deportations’. The Ministry of the Interior reinforced the units and facilities of the Civil Guard Command of Ceuta as a consequence of the movements, an expansion that is said to continue progressively. The reinforcement is financially backed up by the European Commission: On 2nd of August, after a meeting of Commission President Juncker and Prime Minister Sánchez, the Commission agreed on an additional €3 million of ‘emergency assistance’ under the Internal Security Fund (ISF) to deploy extra staff from the Guardia Civil to the southern borders of Spain. Not only the mere police presence was and will continue to be augmented, but the Unified Association of the Guardia Civil (AUGC) requested to allow the use of means for mass control at the fences – their concrete effect and impact remain to be seen.What is certain is that the situation at the border will become even more confrontational and violent. Nevertheless, on 22nd of August, about 300 people tried to reach Ceuta in another collective attempt to jump the fence. 116 managed to enter Spanish territory, sending boza (victory!) messages about their arrival to family and friends. But they only stayed in Ceuta for 29 hours, as by order of the Interior Ministry of Madrid, they were deported back to Morocco only one day later. On twitter and Facebook, media and activists cite the Spanish Interior Minister Marlaska shouting “Les quiero fuera ya!” (“I want them out now!”) in a phone call with Ceuta police director Alfonso Sánchez in the morning after the jump. The quote is symbolic for the political turnaround of the Sanchez’ government and Marlaska’s wording shows once again that the travellers are perceived and displayed as a threat instead of individuals enacting their autonomy of migration. 17 of the deported travellers are currently imprisoned in Tetouan, waiting for a trial that will take place on the 10th of September, as our local team reports. They are prosecuted for irregular residence and the use of weapons and violence against the authorities. One other person will be prosecuted in Tangier, charges are unclear at the moment. 90 people have been deported to Agadir and Tiznit, one minor was released, and the rest of the group are in hospitals in Tangier and Tetouan. The repatriation operation initiated one day after the collective jump of the 116 people at Ceuta is officially justified as based on a bilateral readmission agreement between Morocco and Spain from 1992. This agreement had not been applied throughout 2018 yet, even if there were several collective entries to Ceuta. Local Alarm Phone activists report that in consequence of its application on 23rd of August, many travellers fled the reception center CETI (Centro de Estancia Temporal de Inmigrantes) and now hide in the streets in precarious conditions, as they fear to be deported to Morocco as well. In 2018, and until the 26th of August, a total of 4,407 people managed to cross into the Spanish colonies via the land border, according to UNHCR data. 1,765 people reached Ceuta, Melilla counts 3,390 new arrivals. Most of them jumped the heavily militarized fences, but people also still cross the border hidden in vehicles or using fake passports. In the enclaves, most travellers are registered in the reception centers, the CETIs. Both reception centers of Melilla and Ceuta are heavily overcrowded. The CETI in Ceuta hosts around 1,400 people with a capacity of 520 the CETI in Melilla hosts 1,150 people with a capacity of 782 in the end of August. Hence not only the centers are overcrowded, but many people also live unattended in the streets of the enclaves, many of them minors, either undocumented in limbo or waiting (for many months) for their ‘salida’, their papers legally permitting them to board a ferry to mainland Spain. On the 31st of August, the Provincial Court of Cadiz decided to reopen the case on the lethal actions of the Spanish Guardia Civil at Tarajal on 6th of February 2014, when the they used riot control materials and smoke canisters on a group of travellers trying to reach Ceuta, causing at least 15 deaths. The case had been closed twice, latest on 26th of January, and it’s reopening is an important step, not only for friends and relatives of the victims, but also for the discussion about what means of border control the Guardia Civil can and will introduce at the Moroccan-Spanish land border. On 29th of August, we were alerted to a boat in distress that had left from Nador, with 52 people on board, among them 6 women. The search of the boat is still ongoing. Spanish and Algerian authorities are involved in the search, but the boat remains missing for over 7 days now. The Alarm Phone is in touch with friends of those on board and regularly contacts the respective authorities. We fear that another tragedy has occurred in the Western Mediterranean Sea. On 30th of August, after an all-night odyssey, 31 people, among them 4 women, landed in the Spanish enclave Melilla independently. They had left from Nador in order to cross the Alboran Sea and reached out to the Alarm Phone the day before at around 1pm CET, calling for help. We were not able to receive a precise GPS position but we could locate a tanker in their vicinity and we stayed in touch with them for many hours. We repeatedly informed the Spanish authorities to the case but they merely stated that the boat was not in their search and rescue zone. The Spanish Salvamento Maritimo informed the MRCC Rabat and said they would conduct the rescue operation. We spoke to MRCC Rabat several times as well and though they promised to engage, nobody showed up to support the travellers in need. Hours passed, and when it turned dark, the situation became increasingly dangerous. Although they were anxious, the travellers did not give up but continued to move on despite being neglected by both Spanish and Moroccan authorities. Incredibly, they managed to reach Melilla safely and on their own. We are relieved that they have survived but their odyssey highlights very clearly a policy of neglect, with the Spanish and Moroccan authorities handing responsibility to each other without anyone engaging. We strongly condemn their behaviour – had the travellers lost their lives it would have been due to their inactions. So far, fewer than 20,000 people have crossed the Mediterranean via the central route this year. In July and August 2016, about 45,000 people crossed the sea and reached Italy. In 2017, over the same period, more than 15,000. In 2018, only about 3,350. This dramatic decline in crossings is the result of violent border enforcements in northern Africa, in particular Libya, where EU member states and institutions have invested heavily to bolster the local deterrence capacities. At the same time, the death rate has skyrocketed – more than 1,100 fatalities have been recorded for the Central Mediterranean. According to data collected by the NGOs, 280 people have lost their lives since the rescue ships Lifeline, Sea Watch 3 and Seefuchs were prevented from rescuing off the coast of Libya. Already starting in June, MRCC Rome began to refuse any responsibility for coordinating rescue operations off Libya. When we contacted them about boats in distress whose passengers had informed us about their location in international waters, they simply did not engage. The same happened again in two emergency situations in July and August. The Maltese authorities denied responsibility as well. Both the Italians and the Maltese told us to call the so-called Libyan coastguards in Tripoli so as to have them intercept the boats and return the travellers to the inhumane conditions they were in the process of escaping. We lost contact with these boats and we do not know about what happened to their passengers. The Libyan authorities – funded and trained by European forces and regularly involved in human rights abuses at sea – are often not reachable by phone or if they are, they refuse to give out any information. The civil war in Libya has, according to some sources, prompted a break-down in the coastguards – will this vacate the maritime area off Libya even further or can this vacuum prompt European politicians to release the civilian fleet again? In the meantime, the search and rescue (SAR) assets of NGOs are nearly all blocked and disallowed from rescuing. Cargo vessels avoid the maritime area off Libya so as to avoid encountering travellers in distress – or if they do some ignore their pleas, conscious that they might be stranded with them at sea, unable to disembark them in Europe. On the 28th of July, the Tunisian prime minister, Youssef Chahed announced that Tunisia would welcome the 40 migrants who had been stranded at sea, on board of the Sarost 5, for over two weeks. As we have reported before, the Alarm Phone had followed the case of the 40 migrants who had entered international waters and the Maltese Search and Rescue (SAR) zone only to be illegally transferred into Tunisian territorial waters. The wooden boat had left from Libya and was rescued on Friday the 13th of July north of an oil platform by the supply vessel Sarost 5. MRCC Tunis as well as the crew of the supply vessel confirmed the position of the migrant boat in the Maltese SAR zone. Both Malta and Italy denied the supply vessel permission to disembark the migrants in Maltese and Italian harbours. On behalf of the stranded migrants we released several of their testimonies. While their odyssey finally came to an end, they remain in precarious conditions in Tunisia. On Monday, the 30th of July, 108 people were returned to Libya by the Italian oil supply vessel “Asso Ventotto”. The people were taken onboard north of the coastal city Zuwarah and were brought directly to the harbour of Tripoli. This practice appears to violate a 2012 decision of the European Court for Human Rights (ECtHR) that had ruled against Italy for having pushed migrants back to Libya: “Returning them to Libya without examining their case exposed them to a risk of ill-treatment and amounted to a collective expulsion.” So far, no similar case has been noted ever since the judgement of the ECtHR. The people brought back to Libya have to fear inhuman treatment in conditions of confinement. According to different media reports, it is unclear who coordinated and participated in the return operation – the Italian coastguards, the so-called Libyan coastguards, or the oil company that owns the Asso Ventotto. Italy repeatedly denied any involvement, despite indicators for Italian participation and therefore a possible violation of international law. What happened to the travellers after their arrival in Libya remains unclear. On the 14th of August, the Alarm Phone was called by a boat in distress coming from Libya, with 31 people on board. Even though the boat was in international waters, MRCC Rome declared the Libyan authorities responsible and decided not to intervene. The boat was able to move north through the night and on the 15th of August, they had moved closer to Malta. Again, MRCC Rome rejected responsibility. In the evening, when the boat had nearly reached Malta independently, did the Maltese authorities engage. The people safely reached Malta. Though few NGOs are still permitted to carry out Search and Rescue (SAR) operations off the coast of Libya, following the criminalisation efforts of the Italian and Maltese governments, some rescues were still carried out in August. On the 2nd of August, Proactiva Open Arms rescued 87 people in distress at sea. Eight of the rescued were minors, six of them unaccompanied. They had been at sea for two days before being rescued. Later in August, the previously blocked Aquarius rescued a total of 141 people. First, on August 10, 25 people were found on a small boat without engine. On the same day, another boat with 116 people on board was discovered and rescued. Among them were 67 unaccompanied minors. Many of the rescued gave testimony to the inhumane conditions in Libya and following the report of MSF, several vessels had passed by the people in distress without offering any assistance to them.The Aquarius was only allowed to enter the port of Malta after a long stand-off and after several EU member states had agreed to relocate some of the rescued. On the 18th of August, another odyssey began, when the Italian coastguard vessel “Diciotti” rescued 190 people in the Maltese SAR zone. However, neither Malta nor Italy wanted the rescued to be disembarked in either of their harbours. Once again, a political dispute was fought out on the backs of the rescued. While 13 people requiring urgent medical care were evacuated, 177 migrants remained stuck on board, even after the ship reached the harbour of Catania. After fleeing war-torn and poverty-stricken countries, they were held hostage on board, and had to suffer unnecessarily in undignified conditions, not knowing what would happen to them, with the Italian government even threatening to return them into torture camps in Libya. After five days, and thanks to the pressure applied by mass protests in the harbour, the rescued were finally allowed to disembark on August 26. In 2015, Sarah Mardini and her sister Yusra Mardini, fled to Greece on a rubber-dinghy. Together with 18 other travellers they tried to reach Lesvos island. When the engine broke down, both sisters who are trained swimmers, jumped into the water. Swimming and towing the dinghy behind them for hours they managed to reach safety for themselves and saved the lives of the others. Eventually, they made it to Berlin in Germany, but they never forgot their past. Yusra Mardini had participated in the Rio Olympics in 2016 as part of a refugee team and was appointed a UNHCR Goodwill Ambassador. Sarah went back to Lesvos several times to support newcomers as a volunteer. Together with an Irish-German friend and a Greek member of the Emergency Response Center International (ERCI) NGO, Sarah Mardini got arrested end of August. They are among a group of 30 who are accused for being in contact with refugees via social media groups and “actively assisting” their illegal entry into Greece from 2015 onwards, according to a statement of the Greek police. On 27th of August, the Greek police issued a press release stating the volunteers were acting in “an organized criminal network that was systematically involved in facilitating the illegal entry of aliens into Greek territory.” ERCI denied the accusation for organised crime in a press-statement. For several days now, the three arrested are held in different prisons in Greece. The lawyer of the two activists from Berlin speaks about a constructed accusation and accused the judiciary of “criminalizing refugee aid”. Spotting teams and rescue initiatives on Lesvos and other Aegean islands are afraid that the general European trend of criminalisation sea rescue will affect again their daily work on the islands. These novel accusations against activists who support refugees to survive Europe’s deadly border regime cannot hide the crimes against humanity that are committed through the so-called hotspots and geographical restrictions that came into practice after the so called EU-Turkey-deal. In September “everything will get better” on the Aegean islands, the Greek minister for Migration, Dimitris Vitsas, promised in early July. He suggested that in September, no more than 10.000 refugees would remain on the islands as the rest would have been transferred to the Greek mainland – to prevent another winter-crisis. Over the last winter periods, people had to suffer in unbearable conditions, with some dying due to the lack of heaters in their snow-covered tents. Now we have arrived in September and nearly 20.000 refugees are stuck on the Greek islands, a consequence of the EU-Turkey-deal. Most tense is the situation on Lesvos Island. There are currently more than 8,000 people crammed into the Moria camp, which was supposed to house around 2,000. Tents and tarpaulins between the containers host several families per tent. For a long time now, the camp has extended to the olive-grove besides. Outbursts of violence happen several times per week. People just cannot stand it anymore, being robbed of every last fraction of freedom and privacy. In May, hundreds of Kurdish people fled because of a huge battle largely between Arab and Kurdish men. Several reports have called out the unbearable conditions in the camp. Medicins Sans Frontieres has stated again and again that the situation is traumatising and causes serious psychological problems. The right of suicide attempts is high, and even children have attempted to take their lives. The UNHCR has stated that the Moria camp was “reaching boiling point” and the Greek government should rapidly speed up the transfer of people to the mainland. “We are particularly concerned about woefully inadequate sanitary facilities, fighting amongst frustrated communities, rising levels of sexual harassment and assaults and the increasing need for medical and psycho-social care”, a spokesman for the UNHCR told the BBC. On Friday, 11th of August 2018, some racist vandals completely destroyed the memorial for the dead at the European borders on Lesvos again. It had stood since October 2013 in Thermi, next to the fishermen’s club, commemorating the death of people fleeing war and trying to reach safety in Europe. The memorial was set up also to thank the fishermen who risk their lives to rescue people at sea or who recover dead bodies. Activists of Welcome to Europe who set it up have gone there once a year since, together with survivors and friends. Also activists of the Alarm Phone took part in several memorial ceremonies. “Destroying the memorial cannot erase the memory!” is written on posters that are now presented in various places on the island. The week that the boat of the activist monitoring project Mare Liberum left its winter-domicile and started to move along the coast of Lesvos island, more than 600 children, women and men reached its shores. Over the course of this week, Mare Liberum was able to witness these mass arrivals on the island that have not been seen for quite some time. On Saturday, the 1st of September and together with several activists and volunteers of the groups active along the northern shores of Lesvos, the crew carried out a Sea-Lift action in Korakas, in unison with bigger actions that took place at Syntagma square in Athens and in several European cities. 1) On the 17th of August, the German media reported that a bilateral agreement between Greece and Germany would soon be finalised. Once implemented, it is intended to allow Germany to send refugees back to Greece within two days and without having any real procedure. This will apply (similar to the bilateral agreement that exists already with Spain) only to refugees who have entered Germany via the Austrian-German border. While Italian and Hungarian governments have rejected similar proposals by Germany so far, Spain and Greece accepted it – maybe also because it will not affect many people – from Spain there will be nearly none who choose the way via Austria and also from Greece, at the moment, most refugees will not choose the route via Austria to enter Germany. 2) The Greek Minister for Migration Policy has also agreed to ‘process’ also the take-back requests Germany sent according to the Dublin-regulation this year (currently around 1,500). In return, Berlin has promised to accept to relocate persons who have applied for family reunification with relatives living in Germany (the estimates vary between 950 and 2,900 with pending or accepted applications). This deal, after the EU-Turkey deal, is the next dirty deal in this region. Welcome to Europe took this as a challenge to update its information for people who might get affected by so called Dublin-return to Greece as well as its information for people who have received a status in Greece but nevertheless cannot survive there and consider to move on. Over the past 6 weeks, the WatchTheMed Alarm Phone was engaged in 197 distress cases, of which 179 took place in the Western Mediterranean, 2 in the Central Mediterranean, and 16 in the Aegean Sea. You can find short summaries and links to the individual reports below. On Monday, the 23rd of July 2018, the Alarm Phone was alerted to a total of 23 boats in distress situations in the Western Mediterranean Sea. 11 were rescued to Spain, 12 returned to Morocco (for the full report see: http://watchthemed.net/index.php/reports/view/967). On Tuesday, the 24th of July 2018, the Alarm Phone was alerted to 20 boats in distress in the Western Mediterranean Sea. 10 boats were rescued to Spain, 8 returned to Morocco. For two boats we have no further information (for the full report see: http://watchthemed.net/index.php/reports/view/968). On Wednesday, the 25th of July 2018, the Alarm Phone was alerted to 10 boats in distress in the Western Mediterranean Sea. 7 boats were rescued to Spain, 3 returned to Morocco (for the full report see: http://watchthemed.net/index.php/reports/view/969). On Thursday, the 26th of July 2018, the Alarm Phone was alerted to 9 boats in distress in the Western Mediterranean Sea. 5 boats were rescued to Spain, 2 returned to Morocco. For 2 boats we have no further information (for the full report see: http://watchthemed.net/index.php/reports/view/970). On Friday, the 27th of July 2018, we were alerted to 16 boats in distress in the Western Mediterranean Sea. 9 boats were rescued to Spain, 6 returned to Morocco. For 1 boat we have no further information. Besides the 16 cases, we were also informed about 8 other boats. We were, however, never able to directly contact them. We have received the information that of these 8 boats, 4 reached Spain, 1 was returned to Morocco and for the 3 others we do not have further information (for the full report see: http://watchthemed.net/index.php/reports/view/971). On Saturday, the 28th of July 2018, the Alarm Phone was alerted to 5 boats in distress in the Western Mediterranean Sea. 3 boats were rescued to Spain, 2 returned to Morocco by the Moroccan Navy (for the full report see: http://watchthemed.net/index.php/reports/view/972). On Sunday, the 29th of July 2018, the Alarm Phone was alerted to 9 boats in distress in the Western Mediterranean Sea. 1 boat was rescued to Spain, 7 returned to Morocco. For 1 boat we have no further information (for the full report see: http://watchthemed.net/index.php/reports/view/973). On Monday, 30th of July, the Alarm Phone was alerted to 3 boats in the Strait of Gibraltar / Western Mediterranean. 2 boats were picked up by the Moroccan Marine Royale, 1 boat returned to Morocco on its own. We were alerted to a 4th boat that had been intercepted eventually, but didn’t have sufficient information to intervene (see: http://watchthemed.net/reports/view/974). On Tuesday, 31st of July 2018, we were alerted to 6 boats in distress in the Western Mediterranean. 2 boats were eventually rescued to Spain, 3 have been intercepted by the Moroccan navy and for 1 boat we lack the rescue confirmation. We were alerted to a seventh boat but couldn’t establish a connection to the travellers. Later we learnt they had been intercepted by the Moroccan navy (see: http://watchthemed.net/reports/view/975). On Wednesday, 1st of August 2018, at 8am CEST, we were alerted to 12 travellers in distress, among them 3 women and a baby. They had left from Cap Spartel at 3am local time. At 8:14am, we managed to reach the boat via phone. In the following hour, we tried to receive an updated GPS position from the boat. At 9:33am we were informed that the boat had been picked up by the Moroccan Marine Royale (see: http://watchthemed.net/reports/view/976 ). On Saturday, 4th of August, we were dealing with 4 boats in distress, 3 in the Strait of Gibraltar and one in the Alboran Sea. 3 boats had eventually been picked up by the Moroccan Marine Royale, one boat returned on its own to the Moroccan shore. We were alerted to two additional boats that eventually were intercepted by the Moroccan Marine Royale, but we hadn’t been able to establish a connection to the boats and couldn’t intervene (see: http://watchthemed.net/reports/view/977). On Sunday, 5th of August, at 12:10 CEST, we received a call from a contact person alerting us to a boat in distress that had started from Nador at 3:04am local time, carrying 35 people. We managed to reach the boat at 12:40am. At 12:51am we received the GPS position of the boat. At 12:52am we called Salvamento Marítimo and passed the information. We also send an email to the respective authorities to document the alert. At 1:23pm we received an updated position that we forwarded to Salvamento. We then stayed in contact with the boat until at 3:38pm we received the information by the contact person that the people had been rescued to Spain (see: http://watchthemed.net/reports/view/978). On Tuesday the 7th of August, the Alarm Phone shift team was alerted to four boats in distress in the strait of Gibraltar. Three of the boats were rescued by the Spanish search and rescue organization Salvamento Maritimo (SM) whilst one was returned to Morocco. (See: http://www.watchthemed.net/index.php/reports/view/979). On Wednesday the 8th of August, the Alarm Phone shift team was informed about six boats in distress in the strait of Gibraltar. Only in one of the cases was it possible for us to establish contact to the boat and get actively involved (see description below). Out of the six boats, only one boat was rescued by the Spanish search and rescue organization Salvamento Maritimo (SM) whilst the others were returned to Morocco. (see: http://www.watchthemed.net/index.php/reports/view/980). On Sunday the 12th of August, the Alarm Phone shift team was alerted by a contact person to a boat with 53 people, including 12 women and two babies. The travellers had left at 1am local time the previous day from around Al Hoceima, and the contact person was worried about them, as they had been at sea for 24 hours. At 1am CEST we called SM, who had no information about the boat. We stayed in close contact with the travellers, who were getting more and more desperate and exhausted. At around 11.30am SM told us that they had localized the travellers, but refused to carry out the rescue operation, and had instead alerted the Moroccan rescue authorities and Frontex to the distress case. At 3.16pm we spoke to SM, who informed us that the travellers had been rescued by the Moroccan navy, which was later confirmed by the contact person. (see: http://www.watchthemed.net/index.php/reports/view/981). On August 13th, the Alarm Phone was alerted to 3 cases of distress of boats crossing the Western Mediterranean. 2 boats were intercepted and brought back to Morocco, and one was rescued to Spain (See: http://www.watchthemed.net/index.php/reports/view/982). On August 14th, the Alarm Phone was alerted to 3 boats having left from Morocco. One was rescued by the Salvamento Maritimo and brought to Spain, while the other two were intercepted by the Marine Royale. (See: http://www.watchthemed.net/index.php/reports/view/983). On August 15th, the Alarm Phone was informed about a boat of 14 people travelling from Morocco and was intercepted by the Marine Royale and brought back to Morocco. The Alarm Phone was first contacted at 7.58am CEST by the travelers. The shift team maintained contact with the boat and they gave their positions. At 9.27am, they informed the team that they had been intercepted by the Marine Royale. (see: http://www.watchthemed.net/index.php/reports/view/984). On August 16th, the Alarm Phone was alerted to two boats crossing the sea from Morocco. Both boats were successfully rescued and brought to Spain in the same rescue operation. (see: www.watchthemed.net/index.php/reports/view/985). On August 17th, at 4.47am CEST, the Alarm Phone was contacted about a boat of 13 people (including 4 women). The boat sent a position at 7.39am, but otherwise was not reachable for many hours. At 9.08am, the Alarm Phone called Salvamento Tarifa with the coordinates and information about the boat. The shift team was able to maintain contact with the boat and Salvamento Maritimo for a few hours, but then lost touch with the boat. At 15.40pm, the Alarm Phone received news that the travelers were on board a Spanish rescue ship, but were not able to receive further confirmation. (see: http://www.watchthemed.net/index.php/reports/view/986). On August 18th, the Alarm Phone was alerted to two cases of travelers in the Western Mediterranean Sea. One of these returned on its own to Morocco, and about the other the Alarm Phone still has no news. (See: http://www.watchthemed.net/index.php/reports/view/987). On the 19th of August at 5.25am CEST, the Alarm Phone was contacted by travelers on a boat. At 5.40, the travelers sent the shift team their position, and shortly afterwards asked the shift team to call the Marine Royale. At 6.03am, the shift team called Salvamento Tarifa with the information, and then called MRCC Rabat and delivered the information as well. The shift team remained in contact with both coast guards for several hours and delivered the positions as the boat sent them. Finally, at 12.35pm, the travelers reported that they were rescued by Salvamento Maritimo. (see: http://www.watchthemed.net/index.php/reports/view/988). On Tuesday 21st of August at 4:02pm CEST the Alarm Phone shift team was alerted to a boat carrying 7 people close to Tangier. We were unable to make direct communication with the boat, and as there had been reports of water entering the boat the contact person instructed us to call the Moroccan navy which we did at 4:40pm. At 8:12pm the contact person informed us that the people were rescued by the Moroccan navy and taken to Tangier. (See: http://www.watchthemed.net/reports/view/994). On Wednesday the 22nd of August the Alarm Phone shift team was alerted to 3 boats in distress in the strait of Gibraltar, of which 2 were rescued by the Spanish search and rescue organisation Salvamento Maritimo (SM) and one returned to Morocco by the Moroccan navy. (see: http://www.watchthemed.net/reports/view/995). On Friday the 24th of August at 7.44am CEST we were alerted to a boat of 5 people. At 8:08am the boat called us to tell us that water was entering their boat and asked us to call the Spanish search and rescue organisation Salvamento Maritimo (SM) which we did. At 3:49pm we spoke with the Moroccan rescue authorities who told us that the Moroccan Navy had intercepted the boat. Over the next few hours we made numerous attempts to contact the people from the boat, and eventually on Tuesday the 28th of August we made contact and were told that the boat had been intercepted by the Moroccan navy and deported to Tiznit (Southern Morocco). (see:http://www.watchthemed.net/reports/view/996). On Sunday the 26th of August 2018 the Alarm Phone was alerted to a boat carrying 15 people, including 2 women, which had set off from Tangier. At 2:45pm we contacted the Spanish search and rescue organisation Salvamento Maritimo (SM) and gave them the information about the case. At 3:47pm we called SM and heard that they had rescued two boats that day, one of which had 14 people including two women on board. We gave the name of one traveller and asked for confirmation as to whether this person had been on board the recused boat. At 4:01 SM called back and confirmed that the name of the person we had given had been on the rescued boat. (See: http://www.watchthemed.net/reports/view/997). On Wednesday the 29th of August 2018, we were alerted to 2 boats in distress in the Western Mediterranean Sea. One made it to the Spanish enclave of Melilla, the other one with 52 passengers remains missing (for the full report see: http://watchthemed.net/reports/view/1007). On Thursday the 30th of August 2018, our Alarm Phone shift team was alerted to three boats in distress in the Western Mediterranean Sea. They were all returned to Morocco (for the full report see: http://watchthemed.net/reports/view/1008). On Sunday, the 2nd of September 2018, the Alarm Phone was contacted at 4.26pm CEST by a contact person who informed us about a missing boat. It had left at around midnight local time from Nador and carried 55 people, including 5 women. At 9.22pm, our contact person confirmed that it was the boat that SM had rescued earlier during the day (for the full report see: http://watchthemed.net/reports/view/1009). On Monday, 30th of July, at 1:11pm CEST, we were called by a boat in the Central Mediterranean, carrying 125 people, among them 39 women and 5-15 children. The rubber boat had left from around Tripoli/al-Khums at 11pm the night before and was on its way to Malta. In the following hours, we tried to stay in contact with the travellers and to receive the GPS position of the boat. We managed to receive a GPS position of the boat and called MRCC Rome at 4:44pm and passed all information. At 8:07pm we called the Italian Coast Guard in Lampedusa again that informed us that they had passed all information to their headquarter that most probably had informed the so-called Libyan Coast Guard. We then tried to reach the Libyans, but didn’t receive a rescue confirmation. We continuously tried to reach the boat again and to receive information from Italian and Libyan authorities, but we couldn’t find out any further information on the boat (see full report here: http://www.watchthemed.net/index.php/reports/view/998). On August 14th at 12 noon, the Alarm Phone received a call from a boat in distress carrying 35 people, including 9 children. The boat had left from Libya. When the Alarm Phone first made contact, the boat was in international waters. The shift team alerted the Italian coastguards (MRCC) to the case. The shift team furthermore stayed in touch with the travelers and received regularly updated GPS positions. At 17.18h CET, MRCC Rome informed the Alarm Phone that they would inform the so-called Libyan coastguards about the boat. The following day, we received updated GPS coordinates from the people on the boat, showing that they had been able to move much closer to Malta. At 18.00h, the Alarm Phone was informed that Malta would conduct a search in the area of where the boat had been last located. At 20.00h, the Armed Forces of Malta confirmed in a press release that they had rescued the boat carrying 35 people. (see: http://www.watchthemed.net/index.php/reports/view/993). On Thursday, the 26th of July 2018, shortly after midnight, we were alerted by a contact person to a boat in distress, carrying 42 people, including 12 children. We received a GPS position that showed them in direction of Chios, but still deeply in Turkish waters. We were told that the situation was very dangerous, with water coming into the boat. At 00.10am, we reached the travellers directly and the woman we spoke to confirmed that they would need to be rescued as quickly as possible because their boat had started to capsize. We informed the Turkish coastguards at 00.14am to the case and they confirmed that they were searching for this boat. At 1.27am, the Turkish coastguards confirmed that they had found the boat and rescued all the people (see: http://watchthemed.net/reports/view/966). On Thursday the 9th of August at 5.40am CEST, the Alarm Phone shift team was contacted by a relative, asking for information about a group of 12 travellers. He forwarded us a position very close to the Turkish coast, and a phone number which we were not able to reach. The relative did not have any further information about the travellers. Around noon we got in touch with a solidarity group at Samos, who informed us that there had been one shipwreck in the night. This group consisted of 13 travellers, of which nine had drowned; two women and seven children. By further investigation we found out that no boat with 12 people had arrived to Samos this day. We passed on the number of the local police station to the relative, who from them got the information that his relative was amongst the survivors, and that the survivors had been brought back to Turkey. We are sad and angry about this loss of lives that would not have happened if they could have taken the ferry to cross the sea. (see: http://www.watchthemed.net/index.php/reports/view/990). On Saturday the 11th of August the Alarm Phone shift team was alerted to two boats in distress on their way from Turkey to Kos. One boat was rescued by the Greek coast guard and brought to Kos, whilst the other was rescued by the Turkish coast guard and returned to Turkey. (see: http://www.watchthemed.net/index.php/reports/view/991). On Saturday the 11th of August the Alarm Phone shift team was alerted to two groups of people close to the land border between Turkey and Greece, one group on the Greek side, and one group on the Turkish side. The travellers on the Greek side were pushed back to Turkey, and both groups were detained in Turkey for several days. (see: http://www.watchthemed.net/index.php/reports/view/1003). On Sunday the 12th of August at around 11pm the Alarm Phone shift team was informed by a contact person about a boat with nine travellers, who were on their way from Turkey towards the Greek island Kos. It was not possible to reach the travellers, but at 11.10pm we called the Greek coast guard and passed on the information we had. At 11.58am the contact person informed us that the travellers had arrived safely to Kos on their own. (see: http://www.watchthemed.net/index.php/reports/view/992). On Friday the 17th of August at 6:18am, the Alarm Phone shift team was alerted to a boat in distress on the way to Kos, carrying 23 people. After being provided with a contact number for the boat, we tried many times via different channels to make contact with the boat, but were unable. At 6:45am we called the Greek coast guard and provided the little information that we had. Over the next few hours we continued attempts to contact the boat, but received no answer. At 1:01pm we received confirmation that the boat had been rescued to Kos island. (see: http://www.watchthemed.net/index.php/reports/view/999). On Tuesday the 21st of August at 1.24am, the Alarm Phone shift team was alerted to a boat in distress carrying 23 people, including 9 women and 9 children. We were given a position for the boat and told that the motor had stopped working. At 1.46am our shift team phoned the Greek coast guard and provide information about the boat. At 2.04am we received information that the Greek coast guard has reached the boat. Finally, at 21:26pm we were informed that all those on the boat had arrived safely in Kos. (see: http://www.watchthemed.net/index.php/reports/view/1000). On Thursday the 23rd of August at 4.45am, the Alarm Phone shift team was alerted to a group of 22 people, including 6 women and 7 children, who were trapped on the island of Nera, close to Agathonisi island. At 4:55am we informed the Greek coast guard and at 5:56am we received confirmation that everyone had been safely rescued and all were in a healthy condition. At 5:10am we were contacted for another case with a boat carrying 33 people. We called the Greek coast guard at 5:15am, provided them with the little information which we had. At 1:13pm we recieved confirmation from a contact person that the boat had arrived safely on Lesvos island. (See: http://www.watchthemed.net/reports/view/1001). On Saturday 25th of August at 4.20am, the Alarm phone was alerted to a boat in distress carrying 59 people, including 15 children and 19 women, close to Chios.. We were told that the boat has a large number of people on board and is moving very fast. At 4:55am we called the Greek coast guard and informed them of the case. Over the next hour we tried and failed many times to reestablish contact with the boat. At 5:41 we were told that the coast guard had arrived and was rescuing the people. A few minutes later we received confirmation of this by those on board the boat. (see: http://www.watchthemed.net/reports/view/1002). On Monday the 27th of August 2018, we were alerted to two incidents along the Turkish-Greek land border. We were informed about a dead body that had been detected in the Evros river and later by a contact person about a group of people in need of support in the Evros region (for the full report see: http://watchthemed.net/index.php/reports/view/1004). On Thursday the 30th of August, we were alerted by a contact person to a boat in distress, carrying 18 people, including 3 children. We received a position of the boat that showed them in Greek waters. We informed the Greek coastguards to the case at around 1.28am. Already at 1.33am, we received the information via our contact person that the people had safely reached Kos Island (for the full report see: http://watchthemed.net/index.php/reports/view/1005). On Thursday the 30th of August, we learned about a group of people that had crossed into Greece via the Evros river and was now held at the Soufli police station. There were 12 people in total, including 7 children and 2 women, one of whom was pregnant. The group was afraid to be illegally returned to Turkey. We knew of this group of travellers already as they had tried to cross to Greece before, on the 11th of August and had been pushed-back to Turkey (for the full report see: http://watchthemed.net/index.php/reports/view/1006). On September 26 people of the Enough is Enough team will join the Cars of Hope collective in Bosnia again to work together with refugees to provide mutual aid and to produce independent border monitoring reports from the Bosnian/Croatian border. Read our reports from Bosnia: here.